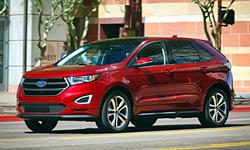 Ford Edge, Yes or No? Thinking of buying my wife a new or slightly used Edge. Are most of you owners happy with your purchase? Is there much road noise intrusion? Thanks in advance. I am very happy with my 2016 Ford Edge. I have an awd SEL model with the 2 L ecoboost engine and have had 0 problems in 8000 miles. There is very little road noise intruding into the cabin. The vehicle is a quiet highway cruiser. Hello, I have a 2016 Edge SEL 2.0 just hit 10k miles. I owned it 1 year. I couldn't be happier with this car. It drives and handles very well. It's faily qujet on the road but you will hear some noise on cement highways. It is a like a hatchback vehicle with no trunk and there is a hatch cover available if you want. Most of our driving is local and we avg 21 mpg. I just came back from a 600 mile trip and got 28 mpg mostly highway driving using regular gas. So far the vehicle still is tight with no rattles. Minor complaint, I wish the headlights were brighter and that they would shed more light on the ground closer to the vehicle. My previous car had turn signal side lights. The other thing I notice is because the hood is straight out it takes a little time to get accousustumed to your exact distance from the curb after a right hand turn. I went in looking for a 6cyl but bought the 4 cyl after test driving it. I have 2015 base FWD 2.0 Ecoboost model-no options to speak of. The Edge is outstanding. I have 70k miles and have not any issues with it so far. Oil changes and a set of tires only. It is a company car. I think the road noise is not an issue at all. The original Michelin tires became a little noisy towards the end of their life. The pirelli scorpion verde tire on my edge now are quiet and ride nice.The standard options on the base model are great. I cannot think of a thing I dislike or would change. Another response said something about the open cargo area. I would like to add that the dark tented window in the rear help conceal cargo. Good luck with you search. bought a 2016 used in December, and I purchased it due to my hyper-sensitivity to road noise and cabin quietness. Was very happy with all the test-drives, although, the 20" wheel setup I ended up with on my Titanium is something to avoid. The Perelli Scorpion Verde are lousy. 2 had seperated belts and I am still battling Ford for the remining 2 to be replaced as they have 23K on them and when on the front the car tracks fiercly. Also, the noise from them I believe to be more than 18" setup. It's taken all the joy out of the vehicle for me as camber, alignments have all been adjusted to try to keep the originals on. I am still not 100% satisfied the car drives like it should. Other than that, I do like all the features and comfort. BTW, I had the well known and documented throttle body issue. Pretty anemic symptoms and Ford dealt with it immediately in an afternoon, so not worth not recommending the vehicle. Quite a well thought-out car.